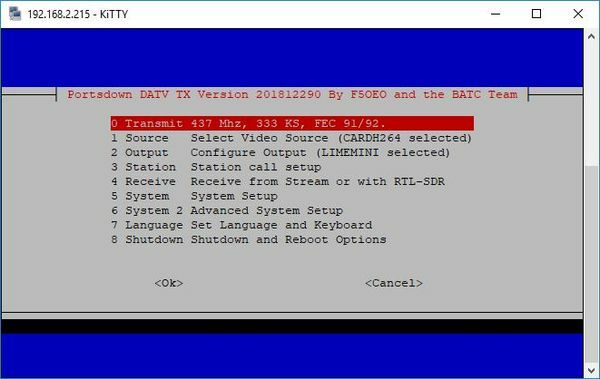 If your Portsdown transmitter is normally configured to boot up and be used in Touchscreen mode and you want to change some parameters such as station name, simply follow this procedure. The process is very similar to initial set up and is done by using an external PC with 2 pieces of software - the first application is to find the IP address of your RPi when it first boots up, such as Advanced IP Scanner and an SSH Terminal application such as Putty. Connect the RPi to the same network as your PC, and turn the Portsdown on. After it has booted up, use the IP Scanner to find the IP address of your RPi. Open Putty and enter the IP address of your RPi and open a connection. At the logon prompt enter the default username of pi and the password given to you with the card. As the Portsdown transmitter is still in touchscreen mode, the putty window will be showing the keyboard commands - try pressing a button on the Touchscreen and you will see the command displayed. You can now make any changes you require (see initial setup for details on options) and as long as you do not change the autostart configuration, the Portsdown will automatically boot back in to Touchscreen mode when restarted. Note - in all menus press the up and down PC keyboard arrows to highlight the item that you require and then the space bar to select it (don’t forget this!). Then press Enter to make the changes and return to the main menu. This page was last modified on 8 January 2017, at 18:05.